At the extreme ends of the Earth, Antarctica is a vast, rocky continent, mostly ice-covered and barren. Surrounding Antarctica, the Southern Ocean is equally vast, cold, and ice-covered. But unlike the land, it teems with life, ranging from microscopic plankton to top predators: whales, seals, penguins, fish, and sea birds. The region’s fecundity is fueled by 24-hour-a-day sunlight in summer, combined with ocean currents that bring essential nutrients. These provide the ingredients for rich blooms of microscopic marine plants and animals at the base of the food chain—phytoplankton and zooplankton—that are similar to those in many productive regions of the world’s oceans. But there is one big difference in the Antarctic ecosystem. The food moves swiftly to the very top of the chain through a crucial link: a shrimp-like crustacean called krill, which swarm in great numbers in pink oceanic patches that range from tens of square meters to tens of square kilometers. The krill connect the microscopic primary producers, which they eat, to the top predators, which eat them. This unique and unusually short oceanic food chain is both strong and vulnerable. It efficiently supports large populations of big animals. But a small disruption in the chain could drastically affect the entire ecosystem. Adding urgency are recent indications of changing conditions around Antarctica—particularly more frequent calving of massive icebergs from the continental ice shelf. To manage and protect this unique environment, we need a more thorough understanding of the intricacies of the ecosystem and the potential effects of climate change on it. Krill are the glue that binds the Antarctic food web, and 20th-century expeditions have learned a great deal about their life stages, distribution, and abundance—but only during the warmer, sunlit, ice-free periods of the year. How do adult and larval krill survive the frigid, sunless winter—when photosynthesis diminishes essentially to zero and much of the ocean is covered with pack ice—to become an abundant food source for large animals the next spring? To pull back the veil on this critical and previously shrouded part of the ecosystem, we undertook 11 cruises to the Southern Ocean, including four unprecedented voyages into the Antarctic winter ice pack. The cruises were part of the Global Ocean Ecosystem Dynamics Program (GLOBEC), a multiyear, multination, multidisciplinary series of investigations of several touchstone regions throughout the world’s oceans where marine life and fisheries historically thrive. Marshalling scientists across several disciplines, GLOBEC sought to define and measure the myriad factors—oceanic currents, climatic conditions, seafloor topography, biological processes, and others—that converge to create and maintain productive ecosystems. GLOBEC also seeks to provide information on how vulnerable ocean ecosystems are to climate changes. 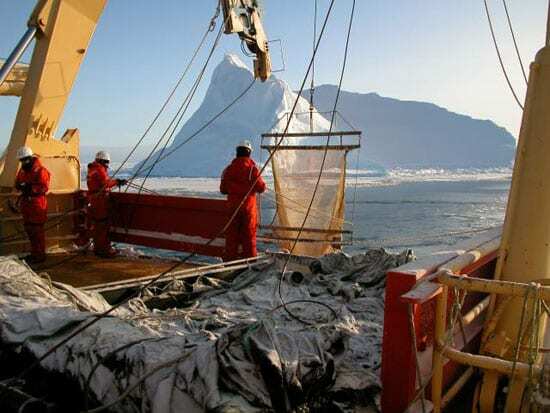 Fieldwork for the Southern Ocean GLOBEC program, conducted between 2001 and early 2003, focused on a broad and relatively deep (300 to 400 meters) continental shelf region off the western Antarctic Peninsula, due south of the tip of South America, from Adelaide Island to Charcot Island. In between lies Marguerite Bay, which supports a persistent and large stock of krill and large populations of top predators that depend on it for food. We suspect that this area may act as a reservoir for maintaining krill stocks hundreds of miles away in the Scotia Sea, as far as South Georgia Island. Marguerite Bay is surrounded landward by high, snow-covered mountains and seaward by huge ice shelves. It is dotted by numerous small islands and persistently covered by sea ice in winter. Below the sea surface, the bay is gouged by a trough that cuts diagonally across the continental shelf and ends in fjord-like features up to 1,600 meters deep in the interior of the bay. Our principal research goal was to discern how these features, along with water properties and currents in the region, conspire to allow krill to flourish and be retained in the area. 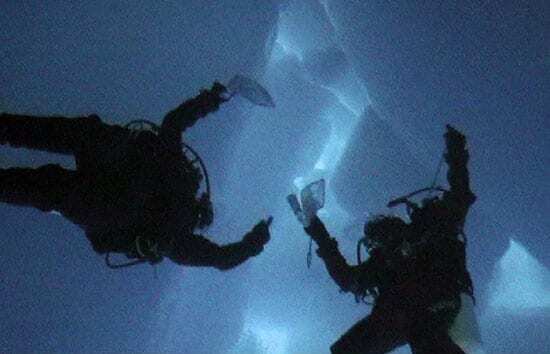 Working in the Antarctic fall and winter was challenging, and the scientists themselves had to learn to adapt. 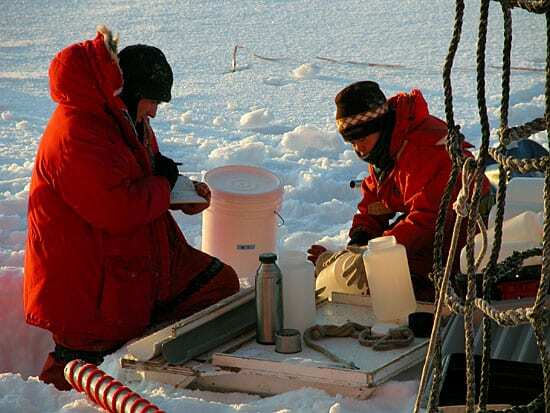 Temperatures during the fieldwork ranged from 0°C to -28.5°C (32°F to -19.5°F). As the late fall turned into winter, bitter cold and near perpetual night set in. The day was a brief, dim twilight. Sea ice covering the water made it very difficult to deploy and tow our instruments to sample ocean waters and marine life. Seizing this rare opportunity to conduct research in these remote locations at these times, a wide range of scientists had to coordinate a wide range of research spanning the spectrum of the region’s physics and biology. It was the first time so many scientists had gathered to study so many aspects of the Antarctic. To accommodate the amount and breadth of research, the scientists had to endure long cruises, 44 to 50 days, in frigid conditions, and had to use two National Science Foundation research ships at the same time. One was the 308-foot icebreaker Nathaniel B. Palmer, which can operate in pack ice and clear a way. The other was the 230-foot, ice-strengthened research vessel Laurence M. Gould, which can come in contact with ice but not force its way through it. In the fall of 2001, we worked mostly in open water, free of sea ice. In these conditions, the two ships could work independently. For instance, scientists studying plankton and those studying penguins could travel to separate locations to do sampling needed by each group. But conditions were much colder when we returned to the region in the fall of 2002—in fact, the coldest in 20 years of measurements there. Sea ice formed almost instantaneously, and we were often beset by sea icebergs that made it difficult or impossible to do our work, or even to get to sampling locations on a grid we had mapped out to ensure coverage of the bay. The ships had to remain together in convoy to get to work sites, with the icebreaker leading the way. Still, we persisted, huddling in our extreme-weather clothing, with the ships casting beams of light into the darkness. 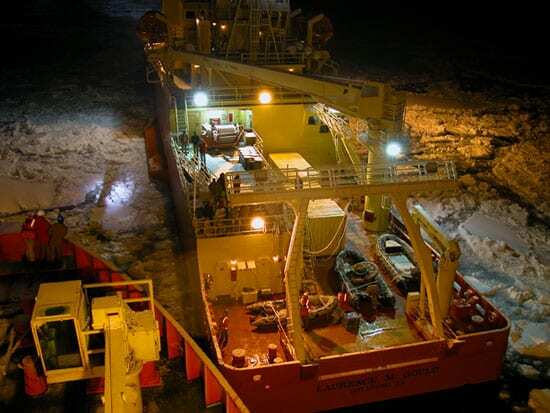 The Southern Ocean GLOBEC cruises resulted in a number of “firsts.” An important accomplishment was to install arrays of long-term moorings in strategic locations across the continental shelf and inside Marguerite Bay. These moorings had sensors that measured water currents, temperature, salinity, and bio-optical properties (such as the clarity of the water) continuously over the two-year period between deployment in 2001 and retrieval in 2003. 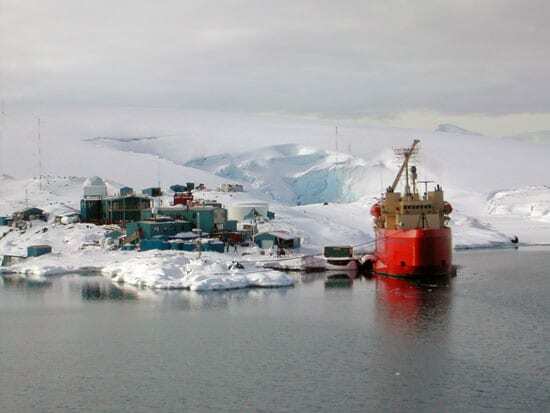 Such moorings never before had been deployed on an Antarctic continental shelf area, and they provided the first-ever measurements of currents there. Current surveys based on instruments deployed from the ships revealed large circular eddies swirling on the continental shelf, which may help keep krill in the bay, where conditions favor their survival. The surveys showed that water from the fast-moving Antarctic Circumpolar Current, circulating just beyond the continental shelf, rides up onto the shelf, supplying warmer, more saline, nutrient-rich water into the Marguerite trough and bay. Such intrusions moderate winter conditions in the bay and enhance its fertility. Oceanographers also found a previously unknown southward coastal current that flowed along Adelaide Island, into Marguerite Bay, and then south along Alexander Island. Our hypothesis is that deep and recirculating currents in the bay support krill reproduction, and the coastal current may move krill progeny along the coast to other areas. Scientists and engineers also moored pressure-protected instruments on the seafloor, both on and off the continental shelf and in Marguerite Bay, to record marine mammal calls for a year at a time and open a previously inaccessible window onto cetacean life in this region. Two automatic weather stations were installed on Kirkland and Faure Islands in the middle of Marguerite Bay. They continue to operate today, providing the first continuous meteorological observations from this region of the Antarctic. The aim of the biologists aboard the GLOBEC cruises was to survey krill and other plankton in the water and map where their populations are. To accomplish this, we needed a combination of tools and instruments. Adult krill swim fast and are notoriously good at avoiding capture by the relatively small nets traditionally used by oceanographers. To circumvent this, high-frequency acoustics has become biologists’ tool of choice for surveying krill. A transducer emits sound into the water. When sound waves, propagating at 1,500 meters per second, hit animals in the water, a portion of the energy is scattered back to the transducer. The acoustic signals give an indication of how much animal life is present at different depths, but they cannot identify what species are present. So, despite the krill’s agility, we still use nets to collect samples needed to interpret the acoustic returns. 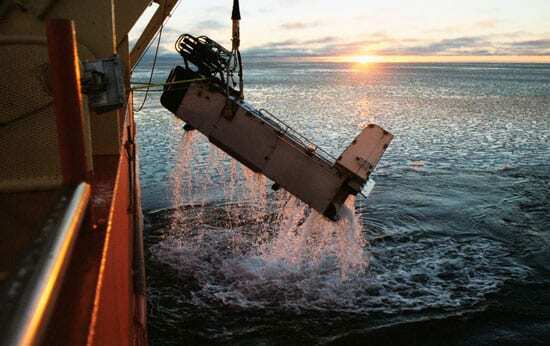 To map the distribution of krill and other plankton, we used a towed vehicle, the BIo-Optical Multifrequency Acoustical and Physical Environmental Recorder, or BIOMAPER-II. It is equipped with an acoustic system with five frequencies, a video plankton recorder system (VPR) to take pictures of the plankton, and sensors to measure water properties. Also in our toolbox was a specialized net towed behind the ship at different depths to collect plankton that are later sorted and identified aboard ship. This net, the Multiple Opening/Closing Net and Environmental Sensing System (MOCNESS), has a 1-square-meter mouth opening that can be signaled to open and close separate nets to capture plankton at different depths without combining the samples. We equipped it with a strobe light to temporarily blind the krill so they could not see the net, thus reducing their ability to avoid it. We used an even larger MOCNESS trawl to collect the larger mid-water animals, such as shrimp and fish. In winter, krill larvae and other plankton often are found living in or just under the bottom of pack ice. So we sent a small remotely operated vehicle (ROV) under the ice. It was tethered to the ship by a cable that transmitted power to the ROV and data from it. Operators could directly monitor and direct the vehicle, which was equipped with a VPR; water temperature, salinity, and depth sensors; and a tracking device to signal its location. Finally, teams of divers also did under-ice surveys of the krill larvae and collected some of them for experimental studies back onboard ship to measure the krill’s rates of feeding, growth, and respiration. 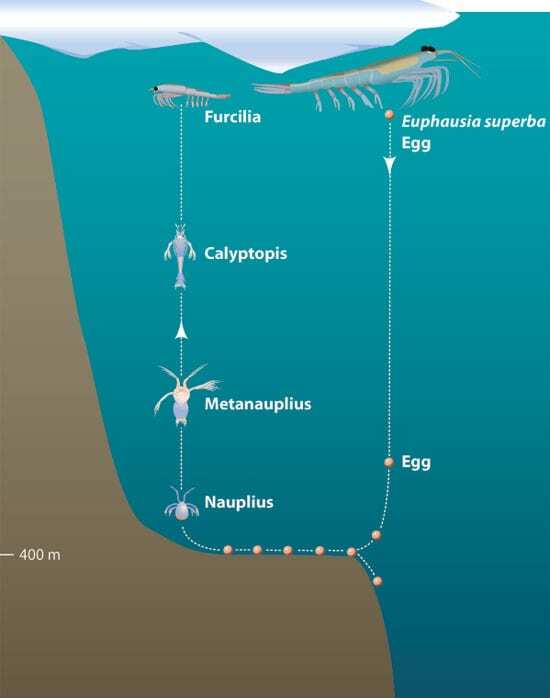 Antarctic krill, Euphausia superba, is the largest and often the most abundant of five shrimp-shaped euphausiid species that inhabit Southern Ocean waters. They grow to lengths of 6.5 centimeters and can live for perhaps seven to eight years—although most get eaten early in life, and few, if any, die of old age. In most ways, the life history of krill is typical of crustaceans. Life begins as a fertilized egg that hatches into a larva called a nauplius. Then, as the larva grows, it goes through a series of larval stages (called metanauplius, calyptopis, and furcilia—several stages of each). When the larvae’s exoskeletons become too small, they molt and grow progressively larger exoskeletons, until they become adults. But in some other ways, Antarctic krill have an unusual life history, facing challenges inextricably linked to their environment. To survive here, they need not only the long light conditions of summer, but also the icebound sea of winter. Scientists on the British Antarctic Expeditions discovered 80 years ago that krill eggs sink to depths of 500 meters or more before hatching, perhaps to avoid predation near the surface. (That requirement fits nicely with the depths of the western Antarctic continental shelf.) But the larvae eventually have to swim back up to sunlit surface waters to find enough food (phytoplankton and zooplankton) to grow through their larval stages to adulthood. 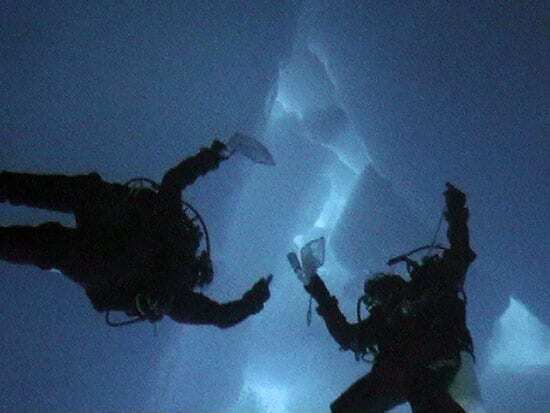 Antarctic water is very cold, only 1°C to -1.8°C, and the cold temperature slows the krills’ larval development. Krill eggs hatched in the austral spring only make it to the fourth, or furcilia stage, before winter sets in. By that time, pack ice covers the water, and no phytoplankton grow. Neither krill larvae nor adults have stored enough lipids (fat) to provide energy to see them through until spring. So how do they make it? Two field seasons of the Southern Ocean GLOBEC program in the Antarctic fall and winter have significantly improved our understanding of how krill survive the winter. Part of the answer is that krill larvae that reach the surface congregate in, or just under the bottom of, pack ice. In the open ocean, anything that can be used as surface will be used as one—to grow on, huddle on, feed on, or get caught on. In the pitted underside of the ice are phytoplankton, ice algae, microzooplankton, and organic detritus. We found that larval krill have flexible feeding habits and can eat this diverse, albeit scarce, buffet. We found from shipboard studies that at least some of the larval krill are able to obtain enough food within and under the ice to meet their nutritional needs during the austral winter, though they could not find enough food to grow. But they can delay their growth, molting, and development, or even suspend them for a time. They can even survive some period of starvation by digesting some of the carbon and nitrogen in their own exoskeletons and muscles. As for the adult krill, we discovered two “hot spots” where large populations of krill accumulated: Labeauf Fjord in Marguerite Bay and Crystal Sound just north of Adelaide Island. The krill in these areas occurred in a dense layer between 50 and 120 meters below the sea surface. We found another hot spot off the northern end of Alexander Island, a region of rough bottom topography. We are currently analyzing our data to explain these hot spots. Not surprisingly, large numbers of seals, penguins, and whales also frequented these areas. 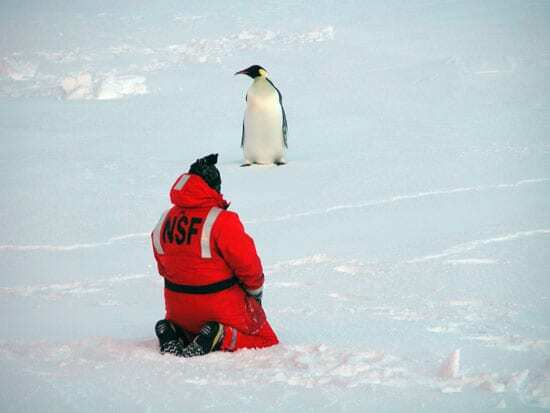 While scientists on Palmer surveyed and counted krill, sea birds, penguins, seals, and whales, other investigators aboard Gould focused on experimental studies of seals and penguins. They temporarily captured a number of animals to measure their physiological properties and later released them. At the same time, they attached tags carrying temperature and pressure sensors and a transmitter that could send data via satellite back to a computer logging system. The data recovered from tagged Crabeater seals and Adelie penguins revealed their diving and feeding behavior, and researchers discovered some movements that they hadn’t suspected. For instance, Adelie penguins can dive to much greater depths and can travel farther and faster than scientists previously believed. Because the tags recorded top predators’ activity for some time, we were able to see that hot spots of krill identified during the cruises continued to be focal points for the predators long after our ships had left the area. Elsewhere in the region, to our surprise, krill did not make up the majority of the zooplankton population. Instead, animals more typical of other ocean ecosystems, such as copepods (small crustaceans) and pteropods (small planktonic snails) predominated in the water. We still believe krill are the most important part in the chain linking primary phytoplankton producers to the top predators, but in some areas, other zooplankton play important roles in the ecosystem. There is still more to learn about the ecosystem. What about the adult krill? Large adults were abundant in 2001, when the weather was milder. They were largely absent—as were the larval krill—during the second year, when conditions were colder. Where did they go? Was this related to the early onset of pack ice formation in 2002? Even with the icebreaker, we could not reach several places, because the ice pack was impenetrable. In these areas, we suspected the adult krill would be found. Newer technologies, though, will soon help us meet the challenge of the Antarctic. For example, autonomous vehicles (AUVs), robotic vehicles that don’t need tethers, and moorings equipped with biological sensors could gather data under the ice when ships cannot take us there. Some of these vehicles and moorings are now being developed. undefined A more powerful icebreaker now being developed specifically for Antarctic research will provide better access to ice-covered seas. The Antarctic region is a formidable and sometimes forbidding place in which to work, but it is also a region of great beauty. Even more, it is susceptible to climate change and is a linchpin in the forces that cause global climate variability—since melting polar ice will create cascading effects through the world. It will be important for us to be able to anticipate the impacts of climate change on the Southern Ocean ecosystem. To do that, we anticipate that future research programs will build on GLOBEC’s legacy of an integrated, multidisciplinary ecosystem approach, and we will do more work in the harsh, dark Antarctic winter.